Lounge and relax in Longhorn Hideaway. Longhorn Hideaway - Quite neighborhood near McCall Municipal Golf Course Nearby back country access, close to downtown McCall PLEASE NOTE - Garage NOT accessible to guests. Time to Dine. Friends and Family gather. Living area opens up to kitchen and dining. Gather round - pick a seat. Plenty of counter space for the cook. Entertain and BE entertained with this open concept. Laundry area off of kitchen. Main level bathrooom with shower. Hall access to this bathroom. View from hall. Main level - King bedroom. Let the light in Main level King bedroom facing hall. Warm up by the Propane fireplace. Enjoy the view from the loft. Additional sleeping. Access the clubhouse, bathroom, and 2nd bedroom from loft. Welcome to the Clubhouse. Longhorn members only :- Upstairs bathroom with tub only. Upstairs Queen bedroom. Rocking chair - enjoy your downtime. Comfortable, two level home in the quiet Timberlost neighborhood with golf cart path access just down the street. Within five minutes in either direction from back country access and trophy fishing at Little Payette Lake to Ponderosa Park or the hub of shopping and dining in downtown McCall on Payette Lake just 1 ½ miles away. Spacious living room with propane fireplace and access to back yard with small deck, fire pit and a grill too! 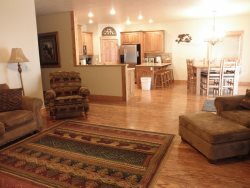 Up to eight people can enjoy the welcoming atmosphere of Longhorn Hideaway. With two bedrooms, sleeping Loft and two bathrooms everyone will find a space to gather and lounge after a day of fun and adventure. Even your pup can get in on the day’s activities at this pet friendly home. Downstairs has a bedroom with king bed and hall access to bathroom with shower. Upstairs is a lounge and sleeping loft with a futon, twin bed and sofa sleeper, television and a tree top view of the wooded neighborhood. On this level you’ll find another bedroom with queen bed and hall access bathroom with a jetted tub. The loft has a small, Kids Clubhouse play nook that makes a fun fort. This home is located on a corner and has a short, circular drive that can accommodate two to three vehicles - Sorry NO garage access for guests. Please refer to rates page for specific length of stay requirements. PLEASE NOTE: Garage is NOT accessible to guests.